An easy tootle around the bikepaths and sights of Launceston. You'll enjoy Launceston's historic buildings and parks, the pleasant offroad Inveresk Trail, the peace of Heritage Forest park, a view of some typical suburbs, and lovely views across the Tamar River. 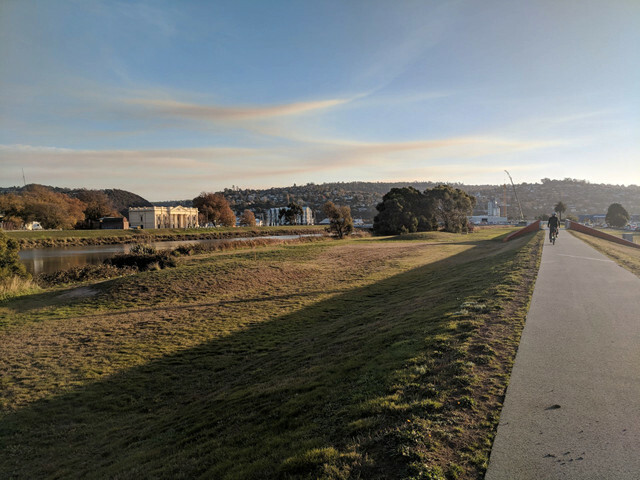 This is a nice little introduction to Tasmania's historic northern city of Launceston, and you'll be riding mostly along bikepaths and quiet streets. It is designed as a loop ride, taking you along the side of the North Esk River and returning along the banks of the pretty Tamar River. You'll start at Brickfields Park, where in the early days of the town a brick factory operated, although you can join the route at any point. You can start with a @poi[coffee here](6822876) :) At Princes Square you'll enjoy a taste of @photo[Launceston's history](3651580). You'll take a pleasant roll through relatively bike-friendly streets in the city, where you can find a number of bike shops and cafes. Most of the roads selected for this route in town have painted on-road bikelanes (but keep an eye out for opening car doors). You'll pass the excellent @poi[Design Centre](6863035) (a visit here to see excellent woodcraft by local artisans is well worth while) and the popular City Park (with @poi[macaque monkeys](6822878)!). Then cross the river and enjoy some fairly new @photo[offroad bikepaths](3651584) along the levee banks. You'll take a detour through leafy @photo[Heritage Forest park](3651586), before returning to the path on the levee bank. When the bikepath terminates near the racecourse, you'll head west, taking to the footpath in sections when necessary. You'll enjoy some more safe offroad paths before crossing the highway and heading across to the banks of the Tamar River. From there it's a pleasant roll back towards the CBD and plenty of opportunities for eating and drinking at @poi[Southport marina](6863071). This is a good outing all year round. ## Links * [Cuccina Cafe](https://www.facebook.com/pages/Cuccina-Cafe-Restaurant/160780493965897) * [Design Centre](http://designtasmania.com.au/) * # More resources * [Arriving at Launceston Airport](https://www.tassietrails.org/trip-planning/launceston-airport-route) * [On Your Bike Tours](http://www.onyourbiketours.com/) # Important Reminders * In the on-road sections of this ride, the traffic is usually moderate. Drivers in Launceston are usually respectful of riders. However, be careful as you check to see what the traffic behind you is doing, indicate, and “take the lane” as necessary (this means, move into the centre of the lane to discourage a driver from trying to squeeze past you). * Riding on the footpath is legal in Tasmania, but of course pedestrians have priority so ride slowly and carefully. * Cyclists are permitted to travel two abreast, not more than 1.5 metres apart, and to take the whole lane if necessary to be visible. But it is sensible to be aware of the prevailing traffic conditions and to be considerate to other road users. * Tasmania has a "minimum passing law". When passing a cyclist, a driver must maintain a safe passing distance of: 1. At least 1.5 metres in speed zones higher than 60 km/h 2. At least 1 metre in 60 km/h or lower speed zones. This law applies to all roads, even where there are bicycle lanes. Vehicles are permitted to cross unbroken centre lines to overtake bicycles, if it is safe to do so. * The weather in Tasmania is notoriously changeable, so have another layer handy. Don't forget sunscreen, Tasmania has high UV levels all year round. ## How to use The route is supported by a printable map and a basic cue sheet. We recommend following the map, and your position on it, via GPS, and also using GPS-assisted navigation cues, if you don't want to miss a turn. The RideWithGPS app is a great tool for this. [Download the app](https://ridewithgps.com/app), and then search for Bicycle Network Tasmania. Select your desired route. ## Feedback? Please contact <ridestas@bicyclenetwork.com.au> with any feedback. While we have made every effort to ensure accuracy of the maps and notes, the information provided is advisory only. Map users are responsible to watch out for changed conditions and for risks from other road users. If you had a great ride, do share your experience on social media and let other riders know about our Ambassador routes.